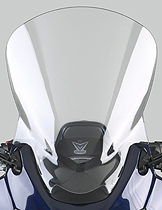 National Cycle's VStream® Windscreens have turned the motorcycle windscreen world upside down – literally! The patented, unique inverted "V" profile creates a quiet and comfortable riding experience unequalled by any windscreen on the market. 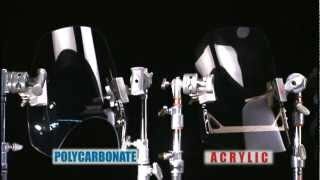 If you're looking for a sport-touring windscreen that WORKS... look no further than National Cycle's VStream! All widths are measured in a straight horizontal line across the back of the screens at their widest point. + VStream+ Windscreens include custom-made, highly engineered and super-strong mounting hardware to accommodate bikes that have no provision for bolt-on windscreens. VStream+ Mount Kits are included for some models to provide sufficient strength and rigidity to mount taller, touring-sized windscreens. 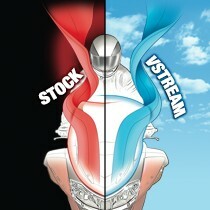 All VStream+ hardware is designed specifically for each model bike and is finished to match the bike's OEM finish. VStream+ Mount Kits are included with the windshield. The typical airflow pattern of the wake from most windscreens is called a van Karman vortex. 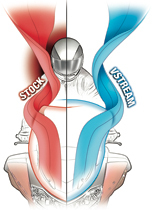 At speeds of 50-90 mph, the air swirls off the windscreen in an approximate 90-degree segment of rotation, hits the bottom of the rider's neck on the way up, and curves off the shoulder at approximately 45 degrees. We gave the VStream® its name for the shape it takes at the upper edge. 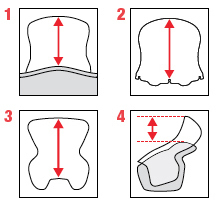 The patented "V" shape is so quiet because it pushes this vortex out and away from the side of the rider's head. The rider's helmet then resides in still air, and the passenger's environment is greatly improved as well. Most VStream® Windscreens are a direct replacement for the OEM screen and reuse the same mounting screws, washers and nuts. If the mounting hardware can be improved, we supply that hardware with the windscreen. Our line of VStream+® Windscreens are for specific models that do not include a windscreen as stock equipment. In these cases, we design and manufacture customized mount kits that attach to the triple clamps or the fork tubes. 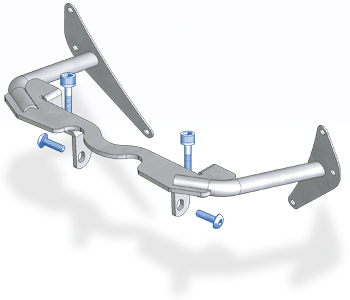 These special mounts are included with each VStream+ windscreen. All VStream® Windscreens are made from thick, durable polycarbonate with National Cycle's exclusive Quantum® hardcoating or FMR hardcoating. These are the best quality windscreens you can get, with excellent optical clarity, unbeatable strength and unsurpassed scratch resistance.